The Dusky dolphin is endemic of ​​the southern hemisphere. Charles Darwin described it during the first half of the 19th century and named it “Delphinus fitzroyi.” Although this name was later modified a couple of times, in Spanish it is still called Fitzroy’s dolphin. The Dusky dolphin is a somewhat small species that bears a great resemblance to the Pacific white-sided dolphin (Lagenorhynchus obliquidens). Even so, scientists confirmed that they are different species from each other, and it is possible to differentiate them by carefully observing the external appearance of each species. It is a dolphin whose distribution is not continuous, so its size varies among populations. In New Zealand, the females have a length of 1.67-1.78 meters and a weight of 69-78 kilograms. The males, meanwhile, are between 1.65 and 1.75 meters and weigh between 70 and 85 kg. The dusky dolphin has a sturdy body with a small head tilted down and a rather short snout, almost nonexistent. The shape of the melon is very noticeable under a bulging forehead. It has a large dorsal fin slightly hunched back with two colors, long pectoral flippers and a caudal fin with flukes split by a central notch and with curved edges. This species has a very distinctive color pattern with a dark bluish or black dorsal area and a light gray or whitish ventral region. But that is not all; The bicolor dorsal fin has dark edges in the front that blend into a light gray color that fades towards the back. The face is white or light gray until the forehead wich is black, and the snout and the lower jaw are also back as well as around the eyes. The pectoral flippers tend to be the same dark color in the front but less intense and blend into white or light gray in the back. The coloring pattern might not be so unique if it was not for the two whitish stripes that start from the tail and extend to the dorsal area. Also, the eyes have a dark “patch” around them. The bicolored dorsal fin is also a distinctive feature. It is only possible to find this mammal in the southern hemisphere around some coasts. It has a circumpolar distribution in regions of Australia, New Zealand, Tasmania, Central and South America, Southwest Africa and Campbell Islands, Tristan de Acuña, Prince Edward, Amsterdam, Malvinas, and Chatham. It is natural to find this species near the coasts, because, it is a coastal dolphin. It inhabits the continental shelves and slopes of cold waters or shallow areas with temperatures of 10° to 18° Celsius. The amount of food they consume varies according to their size and habitat but in general, is based on small fish such as anchovies and hake as well as on squid and shrimp. The most common thing is that it feeds on the surface, but they also do it on the seabed. They perform acrobatic jumps in the air, and they submerge up to 150 meters deep. These dolphins prefer hunting at night. This activity is carried out cooperatively in large groups of up to 300 individuals as they establish organized strategies to perform an efficient hunting. The feeding habits of the dusky dolphin also depend on the region where they inhabit. In Argentina, the members of pods make patterns of slow movements and short dives during the night, and at dawn, they begin to look for food. In New Zealand, they perform jumps and stunts in the air and dive to depths of up to 150 meters. Then they chase and strike the prey very noisily. Every population developed different ways to feed. The Dusky Dolphin is an expert acrobat who enjoys playing and jumping out of the water. Also, it can make high jumps and elegant leaps in the air, usually including most members of the pod. It is quite a show to see the groups jumping coordinated with each other; This happens regularly before and after feeding. This dolphin is also very curious. It is frequent to find it near the boats and following the bow waves. The social structure of the pod of 50-500 members (although there are groups of up to 1,000 individuals) segments into young, mothers with offspring and sexually mature adults. During the day they can stay in smaller groups until the morning when they go into deeper waters and start looking for food. Although this dolphin can travel long distances, it is not considered a migratory species. It has a polygamous mating system; this dolphin maintains transient relationships with multiple partners throughout its life. 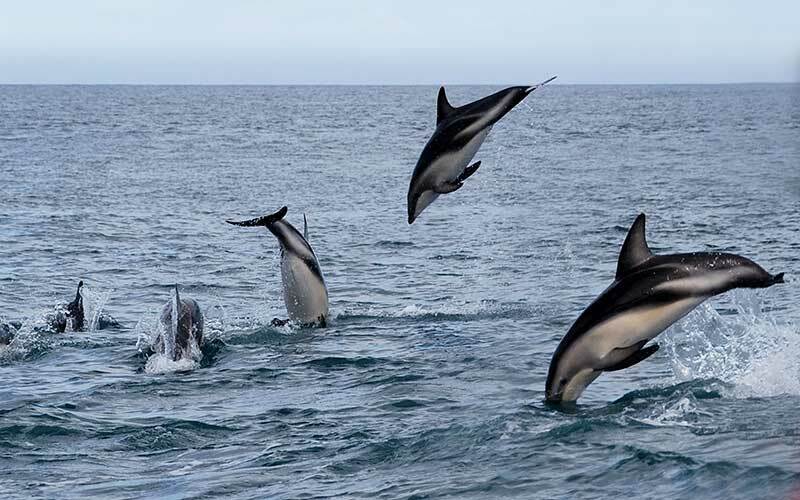 The age for reaching sexual maturity is variable; In New Zealand, this happens when the dolphin is between seven and eight years old, and from that age, the dolphin joins groups of mature males to begin mating near the coasts. In Peru, sexual maturity is between 3.8-5 years old, and in Argentina, a female is mature at 6.3 years. After a competition for a particular partner, the successful male may breed during the spring. After a gestation period of approximately 11-13 months, a single offspring is born during the summer in New Zealand and Argentina and winter if the dolphins inhabit the coasts of Peru. Three years later the calf is weaned. Historically, the dusky dolphin has been a cetacean subject to both incidental and intentional catches which have contributed to the decline of their populations. In Peru, the problem is worrying since thousands of these dolphins are killed each year for human consumption. For example, they killed 7,000 dolphins in the period from 1991 to 1993! A very high number that does not meets the standards of sustainable fishing. On the other hand, bycatch due to gillnets and other fishing gear, reduces the populations dramatically, especially in Argentina and New Zealand. The contamination of waters near the coasts, where these dolphins dwell, and their low reproduction rate also contribute to having a negative forecast. In 1990 the government of Peru banned the direct hunting of any cetacean, but the law is apparently not respected. For its part, CITES (Convention on International Trade in Endangered Species of Wild Fauna and Flora) included the species in the group of animals whose trade needs regulation. The Red List of the International Union for the Conservation of Nature (IUCN) does not have sufficient data to make an assessment of its conservation status. William F. Perrin, Bernd Würsig, J.G.M. ‘Hans’ Thewissen. Encyclopedia of Marine Mammals. Academic Press, 2009. Page 335. Jefferson, Webber, Pitman. Marine Mammals of the World: A Comprehensive Guide to Their Identification. Academic Press, 2015. Page. 293.